Yesterday was my Dad's 98th birthday!!!!! tonight I am having my family over to my house for a home cooked meal of take out Chinese!!!!! My Dad is very fond of Chinese food. I try to avoid it as it is very fattening!!!!! it's for his big day, so he gets what he wants. The man could stand to gain some weight. To honor this great occasion, I went to my fancy linen store to look for new place mats. I was sooooo excited about what I bought, that I took pictures to show you guys. 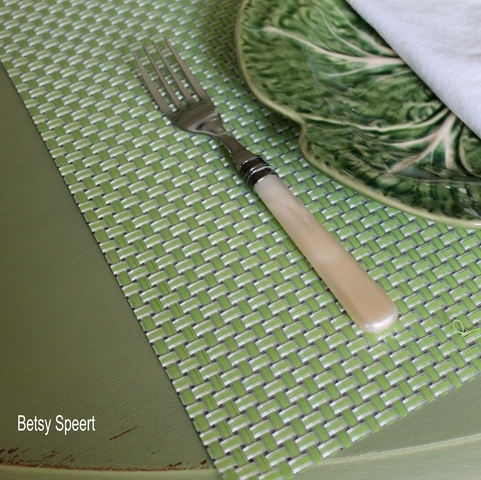 I found place mats, but the piece de resistance was a table cloth. It looks like grain sack!!!!! My flat ware was from Target. This is my one year anniversary of my boycott. but I'm sticking to my guns. back to my table cloth. 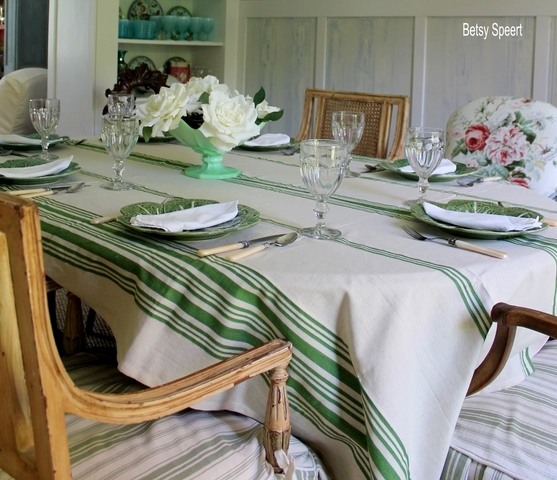 to my awning stripe fabric from Brunschwig & Fils. The whole table looks festive and fresh, just like my Dad! I bought two of these table clothes, 'cuz you know they're going to get destroyed. I also bought place mats. I was going to use them because I like the way I've painted the top of the table. won't put their wine glasses on the bare table and leave stains. They're plastic, so are practical. and what do I do????? 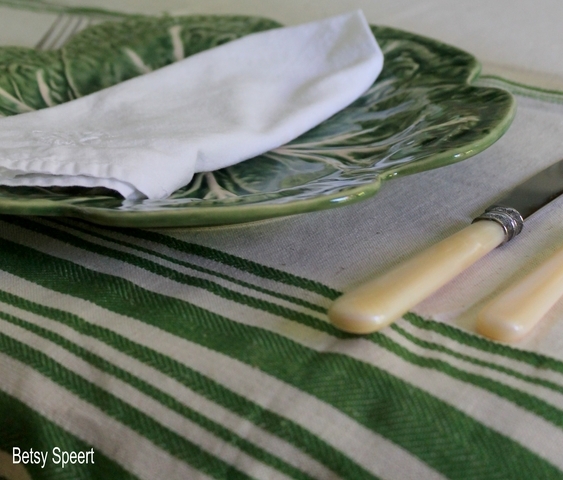 I'm back to using a table cloth. because I am certainly not going to iron the damn thing. May he like what I'm having for dinner. 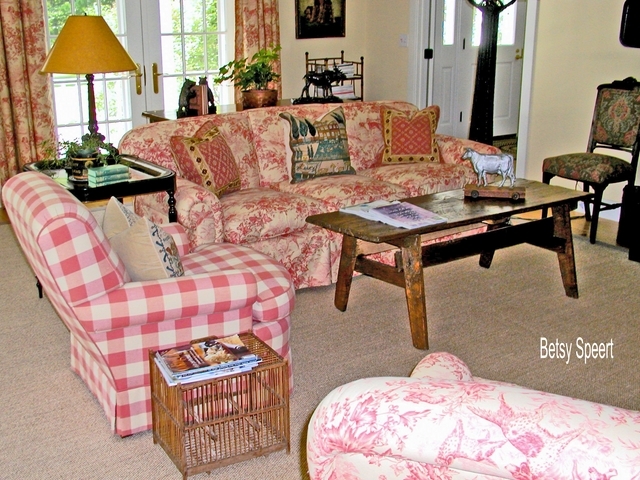 When Connie and I started accessorizing her Vermont home, she definitely liked the feeling of an "American Country Home". I probably brought in stuff from all over the world, but it fell together to work with the Americana tone of her house. and added in some wooden boxes. is household items made entirely of wood. The pioneers made this stuff, 'cuz all they could get their paws on was wood. 'Cuz there was lots of that in pioneer times. They made dishes and bowls and cups and chalices and on and on. Then Connie and I started collecting paintings. We liked the feel of the dark paintings against the creamy walls. They worked well with the armoire that was painted in a black milk paint. On the mantel I did a collection of rams and sheep. The mantel shelf had rams. 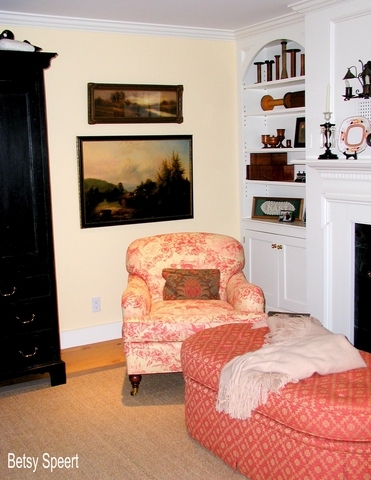 On either side of the painting is a wooden grid that allows the warm air from the fireplace to circulate back into the room. They usually have really ugly vent covers, but the wonderful woodworkers who worked on this wooden home made the wooden grids in their woodworking shop. They would if they could, so they did!!!!! 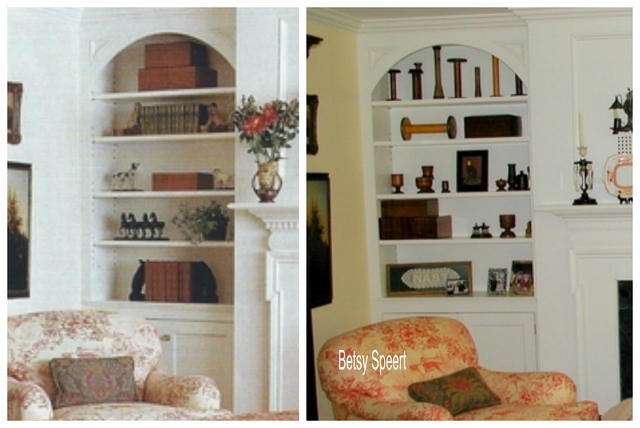 Here's the two ways the bookshelves look. On the left is the Traditional Home styling. On the right is the way it is every other day. The editor felt the way Connie and I had it, would look too spotty in the picture. This is just an example of what looks good in a picture may not be the best for real life. 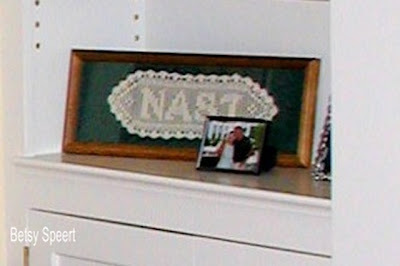 On the bottom shelf is a framed piece of tatting that spells out Nast, which just happens to be Connie and Chris's last name. Connie and I found this pretty reproduction secretary. she didn't need a desk in her living room. So I suggested that she use if for her bar. 'Cuz every living room should have a bar. How else will you be able to tolerate people coming to visit you????? It works great for holding bottles and glasses, plus supplying a surface for a tray and martini shakers. The doors have chicken wire instead of glass, which I love for a country look. 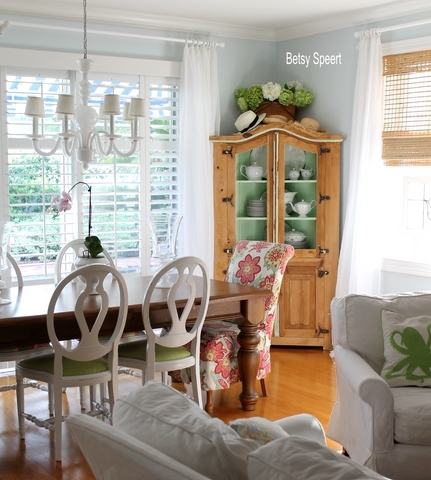 I mixed some wicker pieces into the room, creating a more casual feel for the space. The lamp on the table was made from an antique andiron of a Hessian solder. I had an oiled parchment shade made for it. 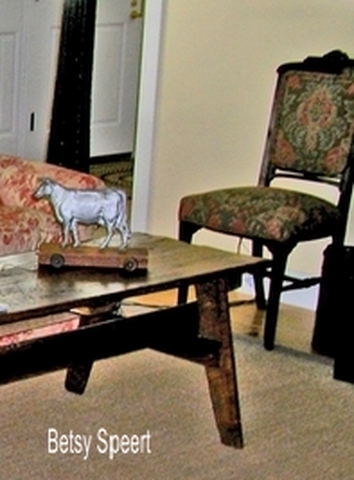 It's cast iron, so it works with the primitive American accents in the room. 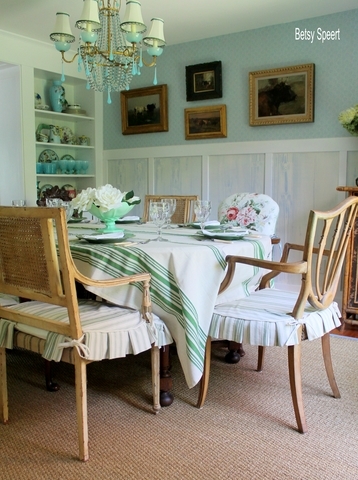 The check fabric on the seats of the wicker chairs is a smaller scale than the club chair buffalo check. 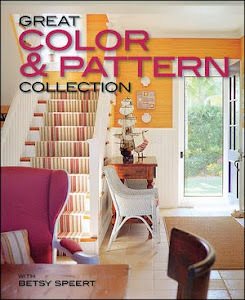 Using similar patterns in different scales is a way to increase visual interest, yet still keep a unifying theme. To the right of the sofa is a wicker floor lamp that I found and stored in my garage. I knew I'd never find one this nice again in such good shape. I had my workroom reline the inside of the shade. Connie loved it, so I was happy to sell it to her. Sometimes when I was out and about, I would buy something that I felt was wonderful and not easy to come by. 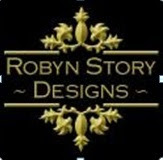 Connie has been a great client, because she never assumed I had some hidden agenda, was was trying to slough some old crap I didn't want onto her. She recognized the gems that I had hidden away. 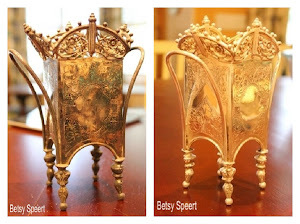 some of the best things in my home are great finds that I snagged for clients who didn't want them. I kept them for me, me, me!!!!! In the picture above, there is a ladder back chair sitting in the middle of the room. It doesn't belong there, and I don't know what it's doing there. I took this photo on the fly years ago. So it was sitting in the middle of the room, in the way of the shot, and I didn't notice because I am brain dead!!!!! and then it's on to the kitchen!!!! 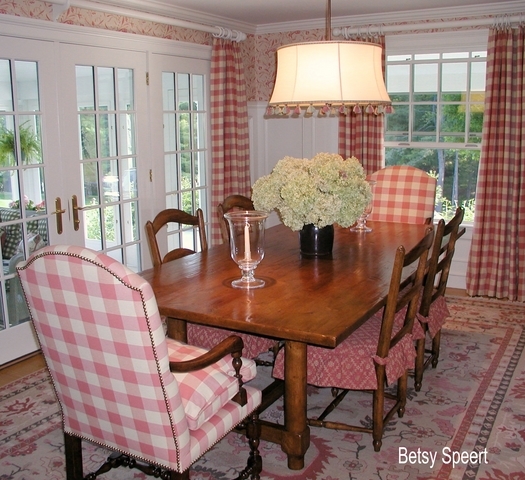 Checks and Toile and Tapestries, Oh My!!!!! Now let's look the other way!!!!!! 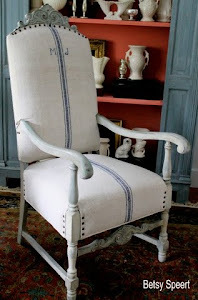 When I work off of a toile fabric, there are some tried and true ways to create a fabric scheme. 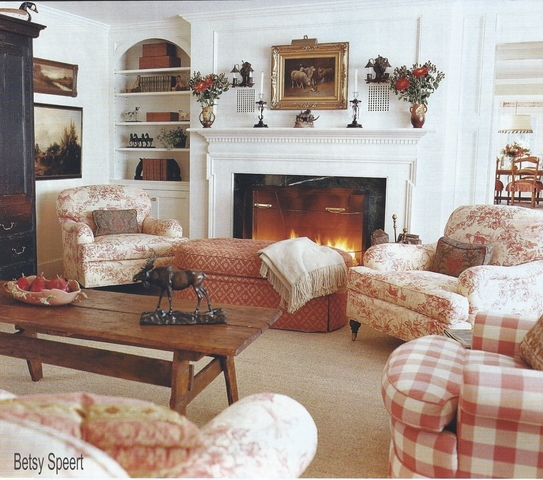 studied magazine pictures of rooms I like!!!!! analyze what they have in common. This is the best way to figure out what your look should be, and how to create it. 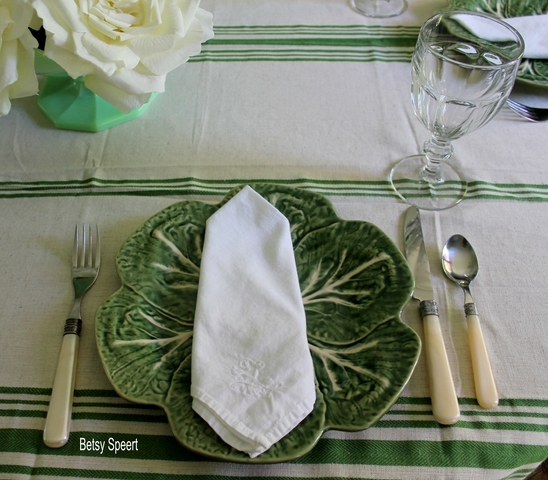 Then I look for checks, plaids, stripes and solids that match the colors of the toile. 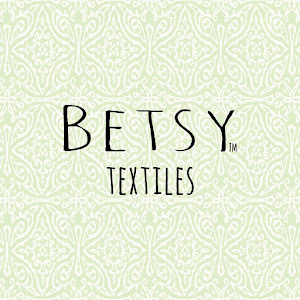 I look for other fabrics that pull in the color, but have other colors too. This keeps the room from looking too static. In the picture above, notice the side chair against the wall. 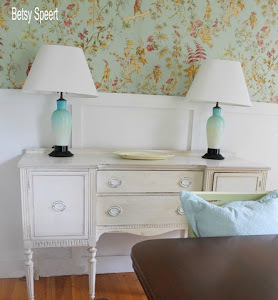 The coral color is in the pattern, so it still works with the room, but the predominant tones are brown and green. I added some more color and pattern with toss pillows. 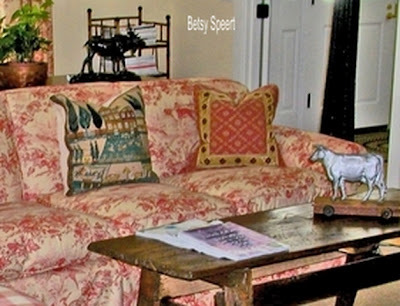 That center needlepoint pillow works because it looks like an American sampler, so it goes with the American antiques spread throughout the room. 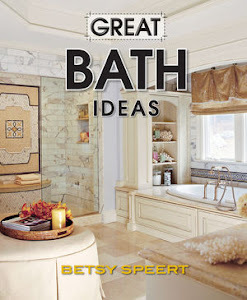 Get a clear vision of the room you want, and then bounce around inside the perimeters of that idea. Connie and I found that antiquing and fell IN LOVE with it. 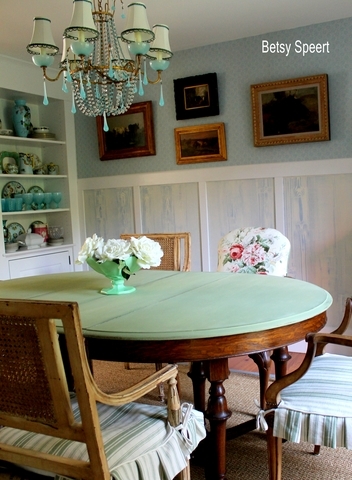 For the wall color, I matched the background tones of the toile fabric. Connie went up to visit the job site when it was first painted. This was when we had JUST STARTED working together. She hadn't embraced her love of color yet. She called me to tell me the walls were bright yellow. So I double checked with the painter that he had used the right hue. the yellow can look much stronger that it really is. And she's trusted me (sort of) ever since. I am not a lover of white walls. I am busy sewing my niece Miriam's draperies. You think you can do it in one day. She only has three windows in the living room. But these are lined and going to be wonderful. I keep offering to do this stuff. Next I have to do her slip covers. It's so lucky that I'm retired. I am once again rambling. How do I end this????? 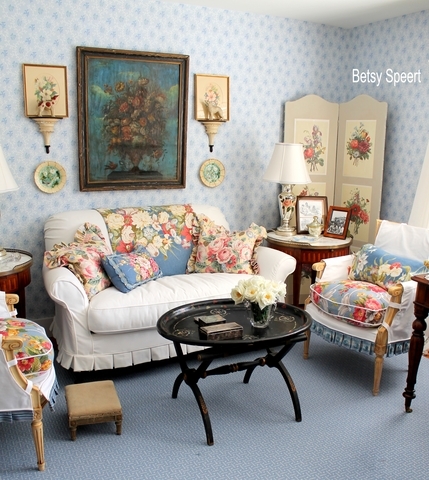 This was the room that Connie first hired me to decorate.We started with the wonderful toile from Brunschwig & Fils. This is when I found out that Connie's favorite color was coral. But the girt just loves this hue. She's blonde, so it looks really good with her coloring. She tends to wear it too. 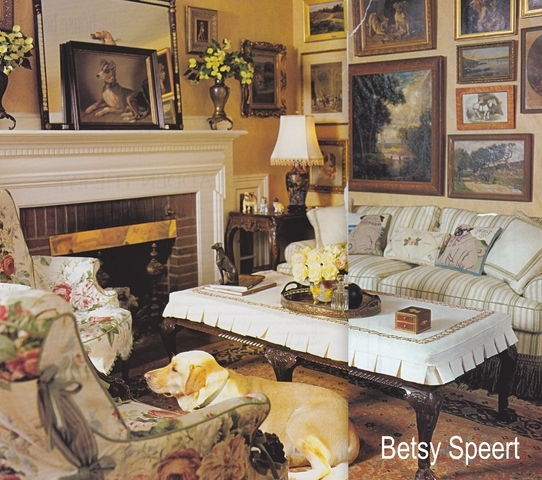 I unified the some of the rooms on the first floor by using the same fabrics throughout the spaces. 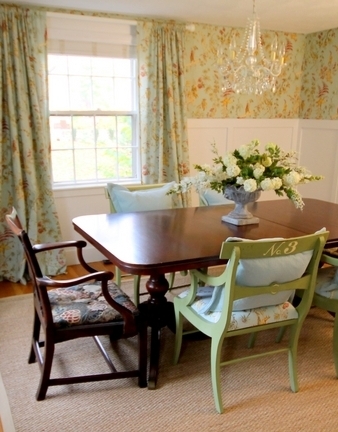 The ottoman fabric was used on the dining room side chairs. Now some folks could accuse me of being lazy. But using the same fabrics in several rooms, in different applications, is a good way to unify areas of a house that are open to each other. I designed the bookcase/fireplace wall and had it installed to everyone's delight!!!!! If I do say so myself.....it transformed the room. I must admit that adding it was Les Brown's (the architect's) idea. 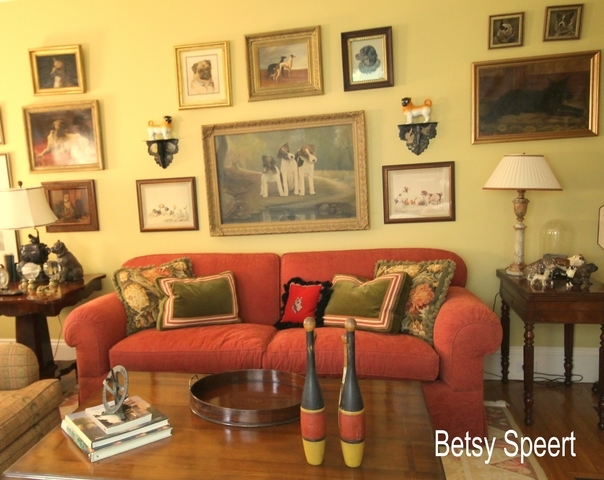 I chose a mantle that was very close to the style I had in my Watertown home. I just copy what I like. I don't have an original idea in my skull. I am a big fat fraud. how's that for no filter????? Folks still ask me questions!!!!! who is asking for free advice. Today, I will answer two that I think the class could benefit from. me with my doggie / decorating dilemma. The dogs are 10" tall, 7.5" wide and project from the wall about 5 ". Ballard Designs and adding a larger shelf. Any advice on proper proportion of statue to bracket? Any other suggestions? a good example is what I did for my friend Kris. First I hung the brackets over the prints. 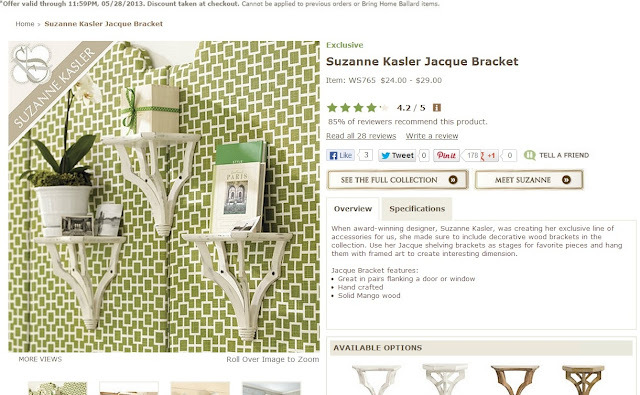 there are many ways that your brackets could be hung. So, there are lots of options. As to the size of the bracket. They should just be a little wider that what ever you are placing on them, unless it is a picture, and then you can have the picture wider than the bracket. The bigger the item, the more room you should have around it, otherwise it will look top heavy. In your case, since the dogs are 7.5" wide, I would want the brackets to be around 9" or wider. But not too wide. But the style of the palm leaves may be more in keeping with your room. 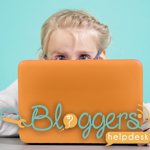 I found your blog yesterday and have spent the last 24 hours lost in all your posts. I love it! 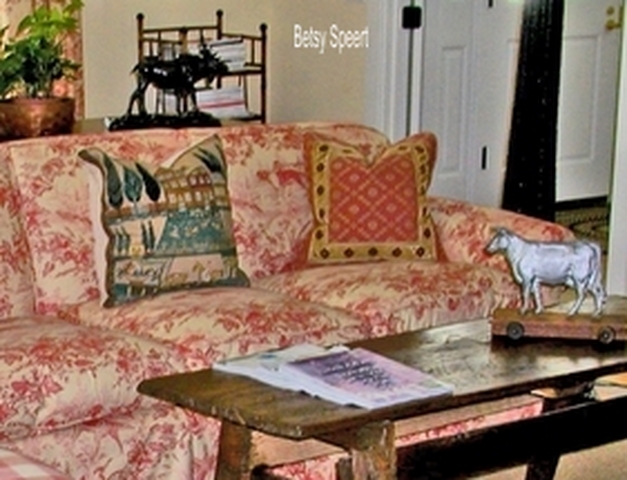 I remember seeing your Sunapee cottage years ago in a magazine and am so happy to have found your blog and see a bit of what you have been up to decorating wise. I have a question which I have been struggling with since we bought our house 5 years ago and I would love your opinion. 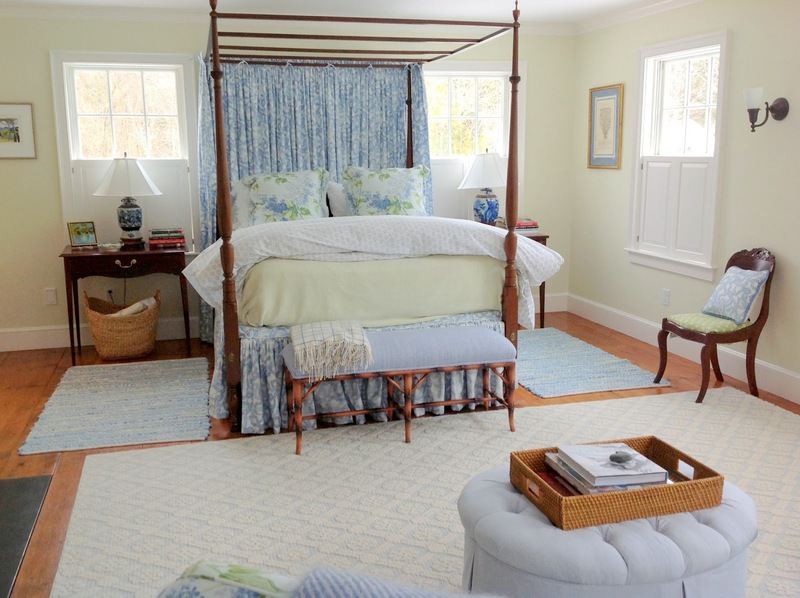 We have a large pretty master bedroom with 7 windows. 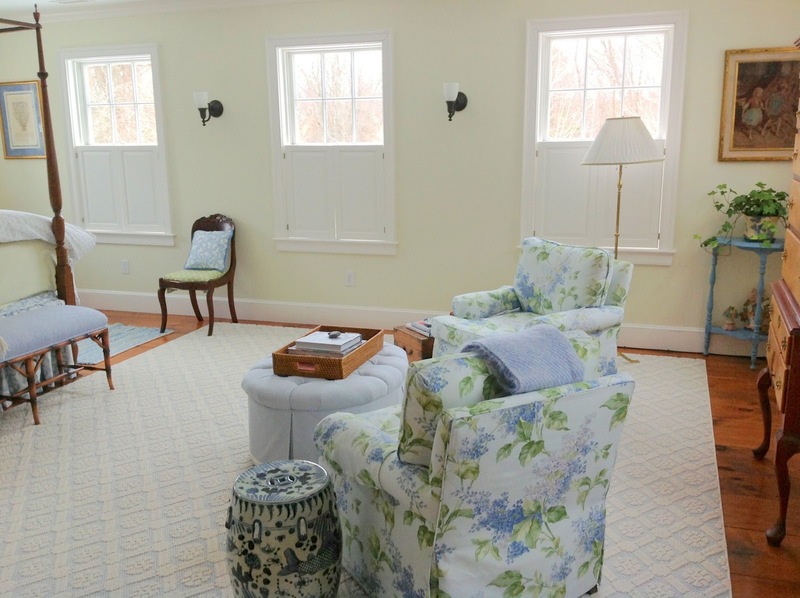 The windows all have half shutters that are really pretty and also functional as they provide just enough privacy. My issue is that the room just is not cozy and I am wondering if it needs window treatments or the issue is something else. 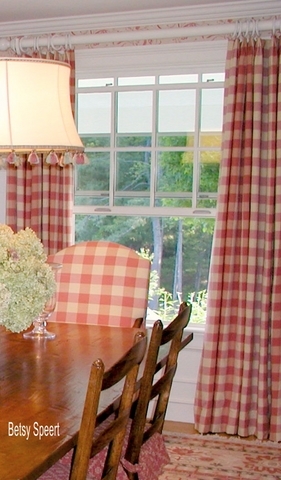 I am afraid of the cost of window treatments as we all know custom treatments no matter what are a lot. I am sending along photos of what I have done so far in the room and would appreciate your thoughts on the window issue and how to make the room cozier. The room is long, maybe 18 feet and has a small attached room and the the closet and master bath. Any thoughts you have would be great! Then she added some more furniture, which helped. YOU HAVE TO SPEND SOME MOOLAH!!!!! draperies will make it much cozier. 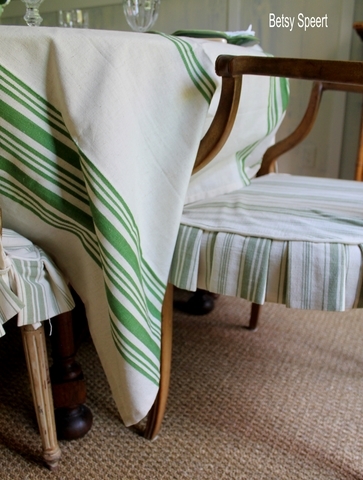 why not get simple sheers and sew them together for a fuller look. One panel looks too skimpy, but two together are nice. If you can't sew, just hang them together on a rod, and that would probably work too. 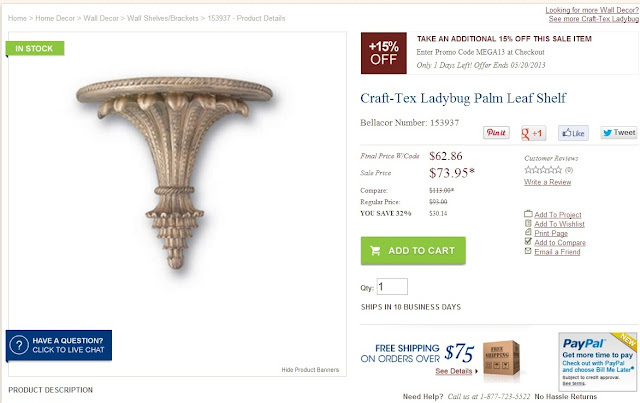 We got the sheers form Pottery Barn. Then we got the poles and rings from Lowes. Then I sewed the pinch pleats at the top and sewed the rings on. If you do some of the work, you can save buckets of money. To see the whole project....look here. I think you would be amazed at what adding draperies would do to this room. I can't feel at home in a place until all the windows have some fabric on them. I still need to do a valance in my sewing/project room. But my needs come after my niece Miriam's, and I'm sewing her draperies for her at present. I pulled my back this morning just pulling up a crummy little weed. I just turned the wrong way. So, I can't sit any longer at this blasted computer. Remember when I told you guys about how I had to fix Connie's Florida dining table, so folks could actually sit at the end????? There were stretchers at the ends (strips of wood) between the legs, so no one could pull a chair up.....no place to put your tootsies.....ya get me??? I had them cut out, so it would actually function like a real dining table. The top overhangs enough to let a chair pull up so's you can eat. 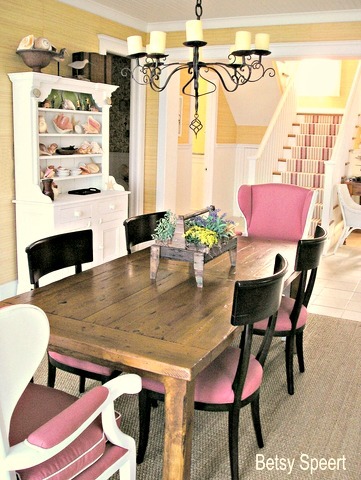 I like the host and hostess chair to be different from the side chairs. Sometime's I do them in different fabric. 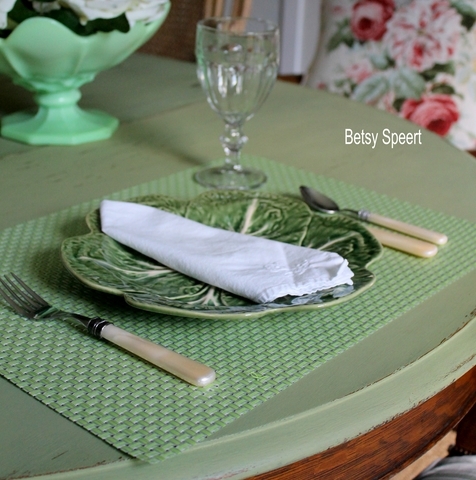 I plan on doing this just as soon as I finish sewing her living room draperies. Her living room is really coming along, and I will be sharing that with you guys in the near future!!!!! and then covered the seats of the side chairs in a plain fabric. 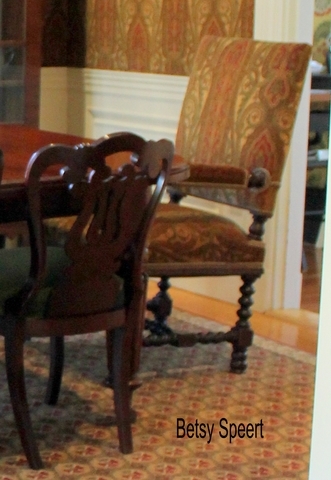 In my own dining room, I have three pairs of chairs covered in two different fabrics. 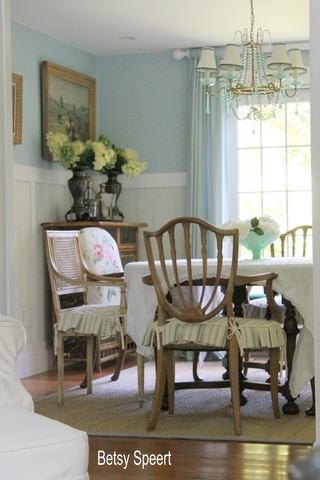 The slipcovers on the square back French chairs used to be on the chairs that are in Miriam's dining room. I gave Miriam her host and hostess chairs, as I no longer had room for them. 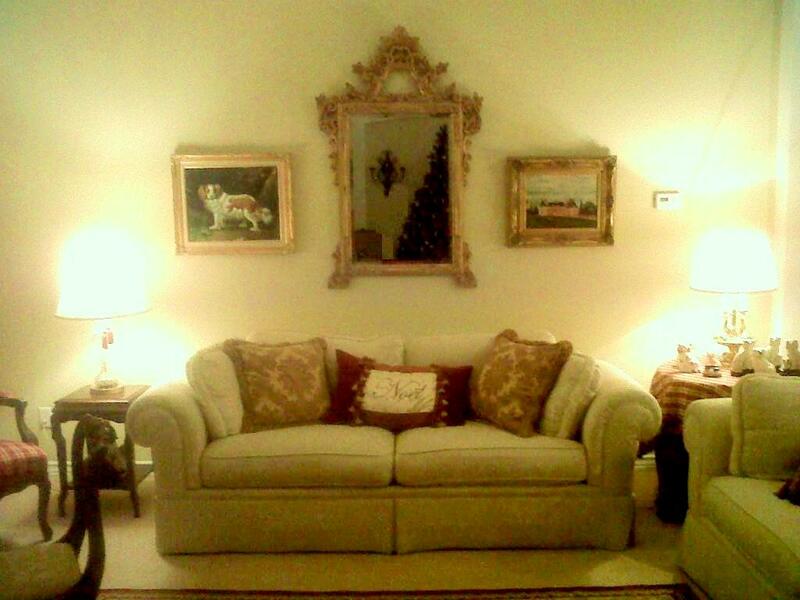 They originally belonged to my grandparents and were used in their New York apartment. When I inherited them, they had beautiful needlepoint seats. I used these chairs for over 20 years and the needlepoint bit the dust. It was really fine and pretty. Don't give me nothin' 'cuz I am the destroyer!!!!! Martha Stewart and I Have the Same Nephew!!!! !